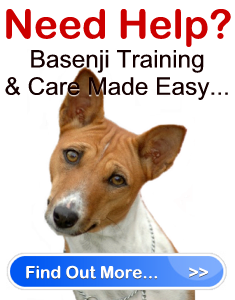 Basenji Puppies Made Easy " "
Do you want to have a dog that has no doggie smell? Have you heard of Basenji puppies? A basenji dog is unique because it cleans itself like an ordinary cat. If you do not a high maintenance dog, then get some Basenji puppies now. Here are some facts about this dog. Basenji puppies are very muscular. They are ideal for owners who live an active lifestyle because a Basenji is an athletic breed. Unlike other dogs, a Basenji has a wrinkled forehead and its muzzle is not long. The color of its eyes ranges from dark brown to dark hazel. Its ears are very erect and its front part is open. The Basenji’s legs are very straight. Another unique physical feature of this dog is its curled tail. Generally, a Basenji’s coat has a tricolor combination. Sometimes, it is a mixture of tan and white, black, and brindle and white. The dog’s coat is very fine and shiny and it is very short. If you are looking for a dog that does not make loud barks, then consider getting one of the Basenji puppies. Typically, a Basenji has 16 inches in height. Its usual weight ranges from 20 – 26 pounds. Most types of dogs, if they are raised and trained properly, grow up to be very active, alert, and very affectionate. Basenji puppies are just like that. A Basenji dog is very smart too. You can see how it quickly responds to your commands especially if you train this dog properly. Basenji puppies are generally shy so you cannot expect them to get along with strangers easily. Most of the time, they just keep to themselves. However, you can always train a Basenji to develop relationships with people. However, Basenji puppies do not relate well with other animals. A Basenji also loves to play especially with children. Because it loves to chew objects, you should give a Basenji puppy several toys. What makes Basenji puppies different from other dogs is that they do not particularly like water. They do not enjoy being drenched in raining seasons. Since this dog likes climbing, you may need to put up some fences. Basenji puppies prefer to lead so you need to provide good training from the start. You need to provide this dog with a very clean and healthy environment. That is because Basenji puppies are very vulnerable to kidney diseases. Always make sure that there is plenty of fresh and clean drinking water for this dog. Make note of any symptoms diseases like intestinal problems, retinal atrophy, and even eye infections. Because it has an active personality, make sure that you give this dog plenty of exercise every day. Ideally, you should keep this dog with other Basenji puppies. Most Basenji puppies will live up to twelve years. Usually, a Basenji can give you at least four to six puppies every year. So if you are looking for a dog that loves to play and does not aggravate your allergies, then raise a Basenji.